Imagine having every single lecture your teacher gave on your iPad. Imagine having interactive ﻿﻿PowerP﻿oints that﻿ illustrate ever﻿y problem﻿﻿﻿﻿, walking you through the procedure step-by-step. Imagine having every proof, illustration, or theorem explained concisely and accurately. 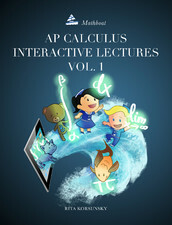 This Book contains immersive and comprehensive Powerpoint presentations for every﻿ topic covered by the AP Calculus AB or the first half of BC. They can be used for both review and learning, a perfect fit for every student no matter their current knowledge of Calculus. With these Powerpoints you will have every ﻿c﻿onc﻿ept ﻿you need to know at the tip of your fingers. This Interactive﻿ iBo﻿ok has all of the tools and teaches you the tips and tricks to master Calculus in no time. The best way to learn is not to just study harder - the answer is to study smarter! Get a Free sample of the iBook version for ipad ! Also available: Kindle and Paperback versions of this book. The title of this book in both Kindle and Paperback formats is "AP Calculus AB Lecture Notes". The Kindle version is very convenient! You can download it on your mobile phone and it will travel with you everywhere you go! You can learn Calculus anytime and anywhere you want! The Paperback version is awesome! You can take notes on this book, study from it, and use it as a test preparation tool for chapter tests, as well as for the AP exam. “This book has excellent visuals, that really help make the material easier to understand. With the interactive interface to user friendly, people can both self teach and have supplementary material for class” - Anis. “Everything in this book is very organized, and the progression of content complexity is perfect as well… explains each concept very clearly, with many nice visuals and diagrams, and utilizes a variety of examples to help students apply these concepts to a variety of problems. I would highly, highly recommend this book! (The design is cute too! )” - Kathy S.
“… lectures are extremely informative and make even the most difficult topics much easier to understand.”- Shayok. “This book has really useful examples and problems similar to those that you will encounter on the ap test. After this book I didn’t need anything else to prep for the ap exam.” Sahil S.
“In every lecture there are concepts with explanations, sample questions, and great visuals. This book quickly allowed me to do calculus with ease and some fun as well. I would give ten stars if I could." Kevin. J. C.
“Terrific lectures. She provides excellent explanations of all concepts and several examples to further help students understand.” - Meera K.
“Amazing comprehensive review. … include many diagrams and examples to really explain the fundamental concepts… After I practiced watching these lectures, my understanding has deepened and my speed at answering the questions has risen greatly. A must-buy if you are looking to score a 5 on the AP Calculus AB or BC AP exam!! !” -Asma M.
“Captivating and effective. I used this book over a year ago, and I still remember every single calculus concept it covered. It also helped me get a 5 on the AP Calculus BC test.” - Allison T.
My daughter got 5 in AP Calculus AB. Mathboat multiple choice book and Interactive lectures were very helpful. We will be buying Mathboat BC books for next year as well. We would highly recommend..! -Mohan D.
“I wanted to fully understand the calculus concepts before moving on to the next lesson at school and I thought this was a great book to help me do just that. I felt that this interactive book gave me the solid foundation that I needed in order to be confident and ready for class the next day. The practice problems in the lectures were also extremely helpful and answered many of my questions! These lectures were not only interactive, but also extremely concise and to the point, which made it even more easier for me to grasp the concepts. I would recommend this book to anyone who wants a solid foundation in the basic concepts of calculus before moving on to the next level.”- Lakshana S.
“The interactive powerpoints in this book are extremely useful for anyone trying to learn calculus or prepare for the AP test. The challenging yet engaging practice problems also made it easy to learn calculus and get a 5 on the AP test. Additionally, all of the Mathboat books have cute characters to help you remember key facts and formulas!”- Michelle S.
“At the beginning of this math year i was struggling a lot with my calculus class and everything seemed so foreign and so in hopes I bought this book to help me understand and it makes me understand everything so much more than before! Without it I would probably still be lost and maybe even failing. I totally recommend this book who is lost in the world of calculus.” -Mariam B. “…clear explanations are all extremely easy to follow along, and allow you to visualize complicated calculus concepts in a way that a simple textbook cannot. Calculus is made fun and easy with these lectures!” -Sanjay S.
“Everything is explained thoroughly and the examples are well chosen and descriptive. I highly recommend this book for any student, teacher, or parent who wants a head start into calculus or comprehensive review.” -T.P. Unparalleled Content and Clarity … a masterful job of explaining and highlighting key concepts to provide a fundamental understanding of calculus …. In this sense, this book is every bit a sterling example of effective teaching as much as it is a gateway towards a mastery of elementary calculus and I strongly recommend this to all students and educators alike.” - V.X. “This interactive and engaging lecture series truly brings mathematics to life! The clean organization and cute designs make the book easy to understand and is a big help for those who are more visual learners.”- Alex Q.L. "I bought the AP calculus AB lecture slide book from amazon and it was quite brilliant." - Sean K.
"Thank you. We do appreciate your products. You make teaching mathematics a little easier." -Linda M.
"I would gladly recommend Mathboat to any teacher. I only had the lecture notes and that alone was very helpful. For 2017 - 2018 school year I want the whole package." - Jacqueline B. "The lecture notes really helped me with the pacing and additional examples for the guided instruction portion of the day" -Nakia S.
I have already purchased a copy of your Multiple Choice Questions to Prepare for the AP Calculus AB Exam for each of my students for next year." -Kim O. "My first time teaching AP Calc AB and 2nd year teaching Calc BC. I was really impressed how u simplified the concepts and made it really understandable for the kids." - Victoria B. "Hi Rita and Mathboat team, I checked many books. Most of them are written for college level. It is very difficult to get the concept of calculus. I finally was lucky to find your support and Mathboat which made my life so easy. I deeply appreciate your innovation in power point. You really saved my life in surviving this subject. Many thanks. God bless you and your company Mathboat. "- John Nguyen. "This is very helpful and well organized resource for preparing AP test exam." -T.M. "This book was very helpful . I covers all the topics in a way that it is easy to understand." P.B. "This book really helped me to understand calculus. The explanations are very good and understandable. Enjoyed the book from beginning to end. Out of the many calculus books I have read, this one is the best." -Susan Y. "Easy to work through. Helped me plan my calculus course" A.C.
"This book is easy to read and understand. It has detailed explanation of concepts and easy to follow examples. It helped me achieve a 5 on the AP Exam. If you want to ace the exam, buy it now!"-H.D. "This book was super helpful. All the lectures were really clear and it made it really easy to understand the concepts. Thanks to this book, I got a 5 on the AP test!" Amanda D.
"....very well laid out book. Great resource." Linda A. "The lecture notes in this prep book were extremely easy to read and greatly aided my understanding of Calculus AB topics. Instead of having large block paragraphs that are commonly found in textbooks and other prep material, all the information in this book is laid out in a way that is easy to follow—including detailed graphs and step-by-step guidance on proofs and difficult examples. This book was essential to my success in AP Calculus AB and helped me receive a 5 on the AP exam." - Angela L.